Michael Grabner isn’t going very far. He may not even have to move. The New York Rangers traded Grabner across the Hudson River to the New Jersey Devils on Thursday night – marking the first-ever deal between the two cross-river rivals – in exchange for a 2018 second-round pick and prospect Igor Rykov. Grabner ranked No. 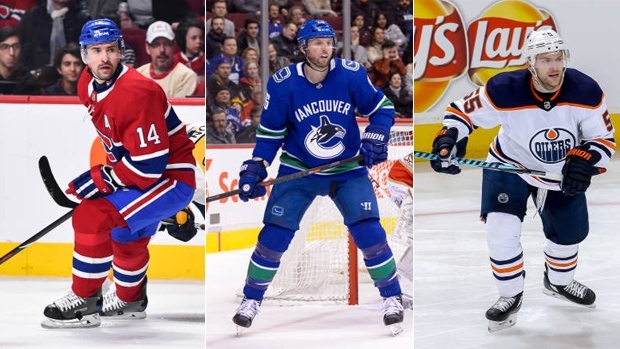 7 on TSN’s Trade Bait board. Along with teammate Rick Nash, who is No. 2 behind only Ottawa’s Erik Karlsson, Grabner was held out of Thursday’s matchup with the Montreal Canadiens as a precaution to protect the deal. Most importantly, Grabner helps set the price for rentals on the trade market. Grabner was just the second rental player – or pending unrestricted free agent – to be traded so far. He is also the first player to fetch a return higher than a third-round pick. Grabner, 30, reportedly generated interest from more than 10 teams, with the Devils arriving as one of the late-comers to the party. They stepped up with their own second-round pick, which is projected to be around 47th overall. Grabner was in the second tier of the scoring left wing rentals behind Nash, Evander Kane and potentially Patrick Maroon. The Rangers, Sabres and Oilers will all be asking for a first-round pick for those players. Grabner is tied for 17th in the NHL with 25 goals, matching Toronto’s James van Riemsdyk and Colorado’s Nathan MacKinnon. Seven of those 25 goals were empty-netters, while 13 total were scored in the third period of games this season. That Grabner had speed to burn, penalty-killing expertise, and a minuscule $1.65-million salary cap hit made him an attractive option for teams. He will help New Jersey, which has a five-point edge on the Eastern Conference’s top wild-card spot, attempt to secure its first Stanley Cup playoff berth in six seasons. For the Rangers, the ability to snag Rykov – a fifth-round pick of New Jersey in 2016 – helped sway the deal. New York would have kept close tabs on the defenceman Rykov this season on SKA St. Petersburg, the same KHL team as Ilya Kovalchuk and where the heir apparent to King Henrik Lundqvist’s throne, Igor Shestyorkin, tends goal. The teardown in Manhattan is now in full swing. Grabner and defenceman Nick Holdenare gone. Coach Alain Vigneault said Nash will be held out of Friday night’s game against Minnesota to protect a potential deal.